House Intel Republicans Have Cleared Trump. So Are The Russia Investigations Over? Semi-lost amid the tidal wave of news this week: The House intelligence committee has cleared Donald Trump in its Russia probe. But the road goes ever on. 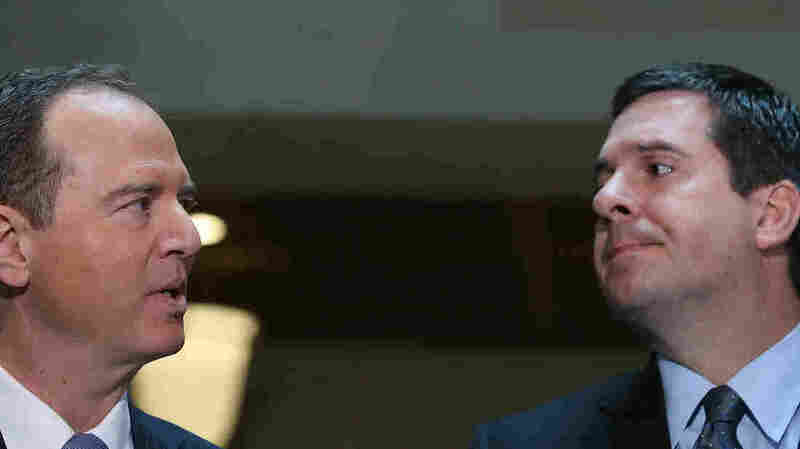 House intelligence committee Chairman Devin Nunes, R-Calif., (right), and Ranking Member Adam Schiff, D-Calif., speak to the media about committee's investigation into Russian interference in the U.S. presidential election, a year ago on March 15, 2017, in Washington, D.C. The House intelligence committee has completed its "Choose Your Own Adventure" story about the Russia imbroglio. Republicans wrote a happy ending for President Trump. Democrats wrote a cliffhanger. Even though members of the committee say they're taking separate ramps off this highway, however, the road goes ever on. Here are 4 more mileposts still to come in the remainder of the Russia imbroglio. Democrats are already unhappy with it, but the leaders of the House intelligence committee say their report is complete. It could land with a thud: It's more than 150 pages, includes more than 40 findings and makes 25 recommendations. For now, though, it's still secret. First, Democrats in the committee's minority need to "review" it — although they've already made clear how they feel — and then it must be declassified by the intelligence community before it can become public. Will it include any new information? The House committee's dueling Republican and Democratic memoranda in February both shed new factual light on the Russia story, even though they were both partisan documents. Republicans' memo focused heavily on the facts involved with what they call abuse of power by the FBI and Justice Department, revealing, for example, that the author of the infamous, unverified Russia dossier was a Never-Trumper. Will the chairman of the House intelligence committee, Devin Nunes, R-Calif., break more new ground in his report or simply make an argument exonerating Trump based on what's already public? The Senate intelligence committee and Justice Department special counsel Robert Mueller, however, aren't quitting yet — of which more below. So Nunes' strategy boils down to a bet on time: He has cleared Trump, but how many revelations could still be coming that he doesn't know he doesn't know about? One basic point of contention between Republicans and Democrats is over interpreting the facts in the Russia case. Republicans say, in effect, nothing in evidence today shows that the Trump campaign conspired with the Russian government's attack on the 2016 election or did anything wrong. The Russia Investigations: Is 'FISA Abuse' Out Of Steam? Intel Committees On Edge? Democrats argue that's not only not so — they believe the evidence does show collusion — but that Republicans won't do the kind of investigation that would uncover new facts they don't want. House intelligence committee Ranking Member Adam Schiff, D-Calif., listed several witnesses he said the Republican majority wouldn't interview, the subpoenas it won't issue and the documents it won't use its power to obtain. "After more than a year investigating Russia's actions in the 2016 election, we are well into the primary season for the 2018 elections and experts are warning that we need to safeguard against further interference," said Ryan spokeswoman AshLee Strong. "That's what this next phase is about and we hope Democrats will join us in seeing this through." House intelligence committee Republicans' decision to wrap up their Russia investigation puts subtle pressure on their colleagues in the other chamber. The relationship between the two committees is, if not broken, badly damaged after complaints of leaks and counter-leaks about their work on the Russia case. Now Republicans on the House side of the Capitol are in a position to say: We've done our work. What's taking you so long? Senate Intelligence Committee Ranking Member Sen. Mark Warner, D-Va., (left) and Chairman Richard Burr, R-N.C. at at committee hearing on on Capitol Hill on February 13, 2018. 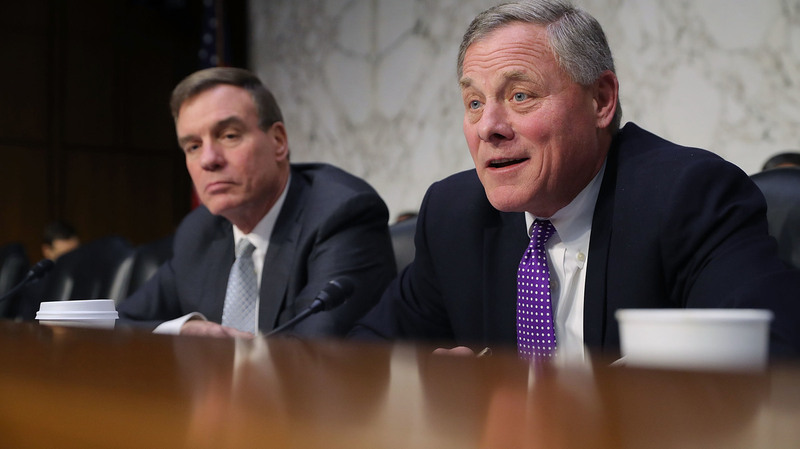 "I have said publicly — and been criticized for it — that our committee was created to operate in secrecy," Burr said last month. "I believe that's where we perform our best work." People familiar with the Senate committee's internal workings have questioned whether it will be able to conclude its work with a single report, or whether its work product might also fission apart in the way the House intelligence committee has. Even President Trump — who has lately acknowledged the Russian interference effort while still denying any involvement with it – said there is a "very, very deep study" that would yield some "strong suggestions on the '18 election." What isn't clear is what will ultimately issue from all this work. The Department of Homeland Security and the FBI have already begun working with state elections officials about cyber-threats and security. Will there be a major new official report from within the Trump administration, or perhaps more than one? If Nunes' vision of the Russia story is correct, all the evidence that exists is all there will be. That may mean Trump and his advisers feel more confident about discussing the general issue of election interference — and that could bring about another new phase in the Russia story. There have already been some indications that a page has turned, as when Trump said last week that he isn't concerned about Russian influence on the 2018 midterms. "We'll counteract whatever they do," the president said. "We'll counteract it very strongly." 4. More action by the special counsel's office? Special counsel Robert Mueller is the joker in this pack. No one truly knows what's up his sleeve except him and his team. So far he has charged a number of Americans and Russians — or concluded guilty pleas about lying to the FBI — but accused no Trump aides with conspiring directly with the Russian interference. If that stands, it'll be a boost for the White House many times greater than the one it got from House intelligence committee Republicans this week.